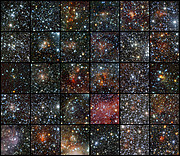 Using data from the VISTA infrared survey telescope at ESO’s Paranal Observatory, an international team of astronomers has discovered 96 new open star clusters hidden by the dust in the Milky Way. These tiny and faint objects were invisible to previous surveys, but they could not escape the sensitive infrared detectors of the world’s largest survey telescope, which can peer through the dust. This is the first time so many faint and small clusters have been found at once. This result comes just one year after the start of the VISTA Variables in the Via Lactea programme (VVV) , one of the six public surveys on the new telescope. The results will appear in the journal Astronomy & Astrophysics. “This discovery highlights the potential of VISTA and the VVV survey for finding star clusters, especially those hiding in dusty star-forming regions in the Milky Way’s disc. VVV goes much deeper than other surveys,” says Jura Borissova, lead author of the study. “In order to trace the youngest star cluster formation we concentrated our search towards known star-forming areas. In regions that looked empty in previous visible-light surveys, the sensitive VISTA infrared detectors uncovered many new objects,” adds Dante Minniti, lead scientist of the VVV survey. “We found that most of the clusters are very small and only have about 10–20 stars. Compared to typical open clusters, these are very faint and compact objects — the dust in front of these clusters makes them appear 10 000 to 100 million times fainter in visible light. It’s no wonder they were hidden,” explains Radostin Kurtev, another member of the team. Furthermore, these new 96 open clusters could be only the tip of the iceberg. “We’ve just started to use more sophisticated automatic software to search for less concentrated and older clusters. I am confident that many more are coming soon,” adds Borissova. Since 2010, the VISTA Variables in the Via Lactea programme (VVV) has been scanning the central parts of the Milky Way and the southern plane of the galactic disc in infrared light. This program was granted a total of 1929 hours of observing time over a five year period. Via Lactea is the Latin name for the Milky Way. 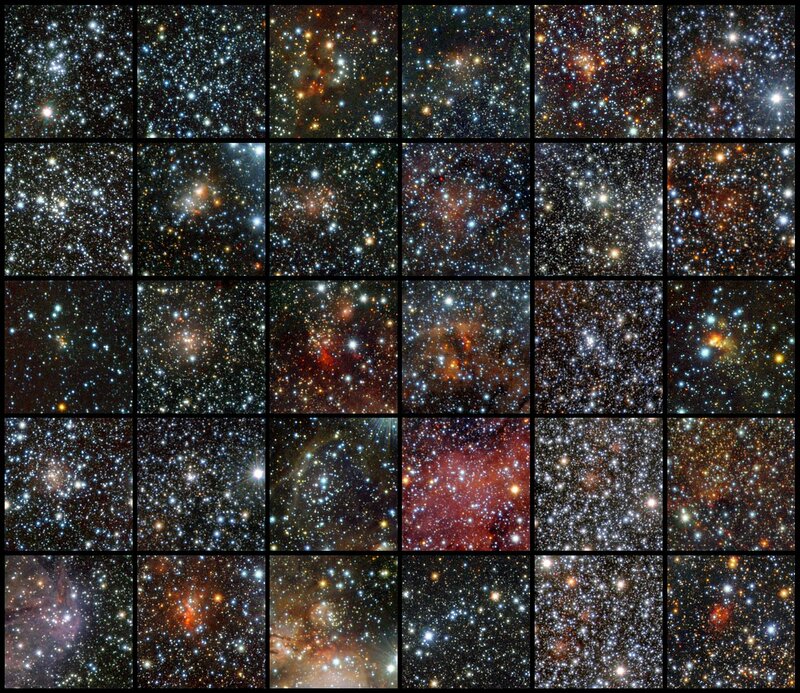 This research is presented in a paper entitled “New Galactic Star Clusters in the VVV Survey”, to appear in the journal Astronomy & Astrophysics. The team is composed of J. Borissova (Universidad de Valparaíso, Chile), C. Bonatto (Universidade Federal do Rio Grande do Sul, Brazil), R. Kurtev (Universidad de Valparaíso), J. R. A. Clarke (Universidad de Valparaíso), F. Peñaloza (Universidad de Valparaíso), S. E. Sale (Universidad de Valparaíso; Pontificia Universidad Católica, Chile), D. Minniti (Pontificia Universidad Católica, Chile), J. Alonso-García (Pontificia Universidad Católica), E. Artigau (Département de Physique and Observatoire du Mont Mégantic, Université de Montréal, Canada), R. Barbá (Universidad de La Serena, Chile), E. Bica (Universidade Federal do Rio Grande do Sul), G. L. Baume (Instituto de Astrofísica de La Plata, Argentina), M. Catelan (Pontificia Universidad Católica), A. N. Chenè (Universidad de Valparaíso; Universidad de Concepción, Chile), B. Dias (Universidade de Sao Paulo, Brazil), S. L. Folkes (Universidad de Valparaíso), D. Froebrich (The University of Kent, UK), D. Geisler (Universidad de Concepción), R. de Grijs (Peking University, China; Kyung Hee University, Korea), M. M. Hanson (University of Cincinnati), M. Hempel (Pontificia Universidad Católica), V. D. Ivanov (European Southern Observatory), M. S. N. Kumar (Universidade do Porto; Portugal), P. Lucas (University of Hertfordshire, UK), F. Mauro (Universidad de Concepción), C. Moni Bidin (Universidad de Concepción), M. Rejkuba (European Southern Observatory), R. K. Saito (Pontificia Universidad Católica), M. Tamura National Astronomical Observatory of Japan, Japan), and I. Toledo (Pontificia Universidad Católica).